One of the many reasons a masonry heater is so good for you is that infrared radiant heat – that which comes from a masonry heater - is basically the same heat with which the human body has evolved over thousands of years. In our modern age, it is easy to forget that electronically controlled central heating systems are only about 50 years old. Meanwhile, for thousands of years, mankind has lived as part of the natural world. As such, the heat to which he is most accustomed is radiant heat. This radiant heat always came from either the sun or a fire. The human skin and circulation system is profoundly affected by radiant heat. Anyone who has lived with a masonry heater can attest to this. And we get the resulting reaction all the time when someone walks into our showroom and feels the heat. What you can literally feel is the penetrating warmth of this kind of heat. The air temperature can be surprisingly low to some people’s standards, yet they report that the feeling of comfortable warmth goes deep. I personally have lived with a masonry heater as my primary heat source for over ten years now. What I find is that I am much more comfortable in my home with an air temperature of 65 degrees F. than I am in someone else’s home with forced air heating at 72 degrees F.
The difference, of course, is the radiant heat and how our bodies react to it as opposed to moving warm air. The human skin is very sensitive to moving air. And the automatic physical reaction the body has to moving air is to constrict blood flow. Recall that moving air is the natural way that our bodies cool off, not warm up. So when the body senses moving air and the body is right on the borderline temperature between warm and not-warm, its reaction is to constrict blood flow to minimize the chances of cooling the blood, and thus, the rest of the body. So the natural reaction of your body to a forced air heating system is for it to reduce circulation. This not only makes you feel colder, but it also means the other health oriented tasks of blood circulation are reduced, making you more susceptible to colds, flu, and other illness. On the contrary, a low-level radiant heat source provides just the bodily reaction we need when we want to be warm and comfortable. Gentle infrared radiant heat actually penetrates deep into the skin and warms every cell. The natural bodily reaction then is to open blood vessels wider, increasing blood flow to every part of your body. Increased circulation, of course, enhances the function of the blood and all the systems of your body, resulting in a stronger constitution and lower susceptibility to illness. Increased blood circulation increases respiration and overall makes you feel more alive. If you’re the kind of person who enjoys being illness-free (um, and who isn’t? 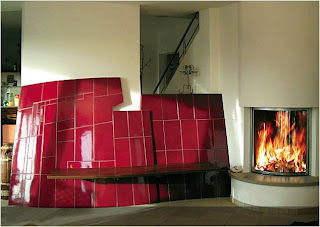 ), then perhaps you should consider having a masonry heater in your home. Look for this column in future issues to find out other reasons masonry heat is healthy heat.